Sarit’s newest hat is done! It’s been done for a while, actually, and I suspect she’ll be receiving it in the mail today. I’ve been delaying showing it to you until I could share the pattern, but I couldn’t hold off any longer! Cute, isn’t it?!? 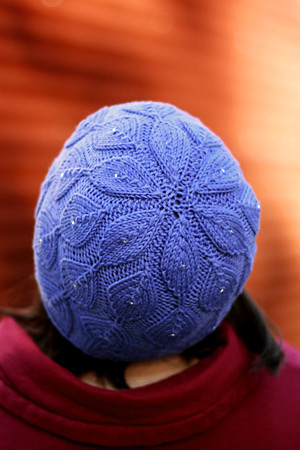 The pattern is (basically) done – I am only waiting to be linked to Ravelry’s Pattern Store before setting it loose. Do any of you have an idea of how long that takes? I filed the request on November 2nd. (excitedly!) EDITED TO ADD: Ah, my impatience shows once again! Just a few hours before I posted, I was granted Ravelry Store access! Watch this space for the link to the pattern once I have everything formatted and uploaded! Leaves…I love leaves! It’s wonderful! This is beautiful! The flower at the crown is a show stopper. It will make a wonderful gift for someone I know. Thanks for sharing it with us. neat, the top is totally organic and really worked out perfectly. nice! Oh, this is by far my favorite hat of yours yet. Well done! beautiful! the crown decreases worked out perfectly. another grumperina pattern that i’ll HAVE to knit! Eeeeeee! That is so cute! I want one yesterday! Stunning! I love it. Hmm – I have some lovely purple cashmere I just recycled, a niece who has a birthday coming up and loves the color purple, I think maybe this would make an awesome birthday gift for her. Oh my gosh, I can’t wait to knit this. Awesome. My 6 yr old daughter would totally dig it…but only in pink. *grin* The kid in me likes the subtle ‘bling’ of the beads, but the knitter in me loves how the hat works at the crown. Just awesome. 🙂 Happy Knitting. Just yesterday I started Odessa, I’ve got to get get it finished so I can knit this one. It’s beautiful! love it! especially how the pattern just starts and there isn’t a typical ribbed brim. It’s beautiful, great work (as usual)! Hope you feel better soon. Very cute!! She’s lucky she’s so cute, or else she wouldn’t have gotten 2 replacements.. okay, maybe she would.. but she’s still so darn cute! Lovely! I can’t wait for this to be available! Wow – that’s super-cool. I’ve been kind of obsessing on hats lately, love this one. It took me about 5 days to get my pattern store up after I asked…..it works really well! Aren’t you already linked? Or only for free patterns? I LOVE the hat! Gorgeous colour, too. Can’t wait to get the pattern! 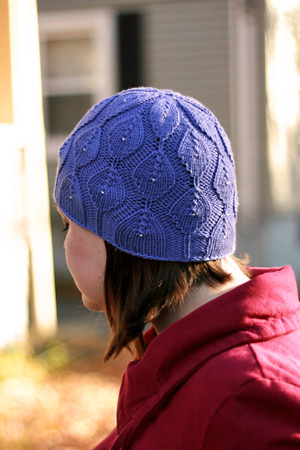 Ooh, I love how the beads in this hat are more like grace notes to the final image rather than being the main focus! Now I just need to finish a project or two and make myself a new hat! that’s a really cute hat! nicely done. This is beautiful! I can’t wait to try it! Very nice! The cold has gotten us as well. My head is about double sized this week. Just bought the pattern and am about to cast on! Thanks for another gorgeous pattern! Gorgeous! I love the detail, the perfect edge, and the perfect whorl at the top. Very cute! Hopefully she won’t lose this one! Love it! So sweet looking. Love the beads. I made 2 of these over the weekend as xmas gifts for my niece & sister in law. Great pattern, easy to follow and best of all a refreshing change to have a pattern with no mistakes! I used Elle Elite wool cotton, very pleased with end result as will be the recipients.